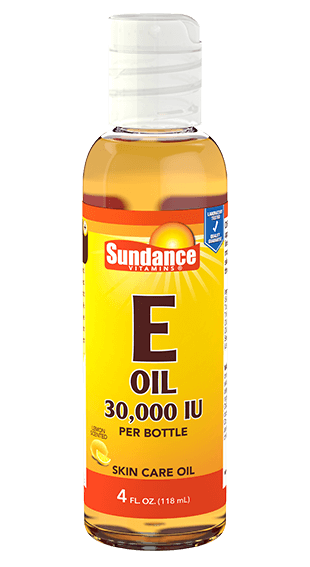 Sundance Vitamins® hydrating Vitamin E Oil nourishes your skin, while also providing your body with a concentrated form of this moisturizing nutrient. For topical use only. INGREDIENTS: Helianthus Annuus (Sunflower Seed Oil), Tocopheryl Acetate (Vitamin E), Triticum Vulgare (Wheat Germ Oil), Vitis Vinifera (Grapeseed Oil), Sesamum Indicum (Sesame Seed Oil), and Citrus Limon (Lemon Oil). DIRECTIONS: Gently apply to rough, dry skin, lines and wrinkles to moisturize and revitalize skin. Apply as needed throughout the day. Mix with essential oils for an aromatic experience. WARNING: For external use only. Do not apply to irritated skin. Avoid this product if you are allergic or sensitive to any of the ingredients in this product. Discontinue use if skin sensitivity occurs. Avoid contact with eyes. Do not use on children or animals. Keep out of reach of children.